£17.95 per pack of 60 capsules. 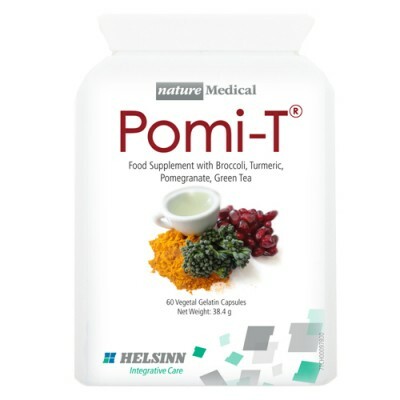 Pomi-T® was designed by a team of health experts after an extensive review of the international laboratory and clinical scientific literature. They combined foods from different categories (fruit, vegetable, spice and leaf) in order to provide a range of polyphenols, each with their unique properties, whilst at the same time avoiding over-consumption of one particular type. Pomi-T® is not a medicinal product, but was tested in the most robust of scientific trials – a double blind, RCT. The trial was peer reviewed by the National Research Institute, governed by the UK National Research Network . The study or its investigators received no commercial sponsorship – this was pure science. The result of this ground-breaking study were announced at ASCO Chicago 2013, as one of only ten full oral presentations in its section, a reflection of the importance and significance of these findings. Broccoli Powder (Brassica oleracea), Turmeric Powder (Curcuma longa), Pomegranate Powder (Punica granatum L), Green Tea Extract (Camellia sinensis), Anti-caking Agent: Magnesium Stearate, Capsule Shell: Gelatine. Each capsule provides on average 150mg each of Broccoli, Turmeric & Pomegranate Powders and 30mg of Green Tea 5:1 Extract, equivalent to 150mg of Green Tea. Click the button below to add the Pomi T Polyphenol 60 Capsule to your wish list.